Bowja 3: Ninja Kami, is the latest installment of the “Bowja the Ninja” series, developed by the talented Robin Vencel of PencilKids. 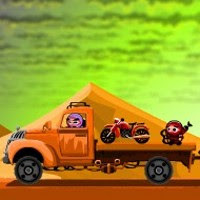 This time out, the tiny ninja must retrieve and return an amulet that has been stolen from the mystical Caves of Kami. Typical to previous games in the series, the game has a polished and cartoon-like style that uses vibrant colors, varied environments, and cute sound effects. The gameplay is both a trial-and-error and point-and-click affair, but most of the puzzles are generally too easy to frustrate. It’s not as challenging, irreverent, or bloody as Vencel’s similar Retardo and the Iron Golem, but Bowja’s latest journey is still highly enjoyable. Fans of the series will know what to expect, and likely won’t need any convincing to check out Bowja 3. For those of you that haven’t yet stepped into the shoes of the tiny ninja, we encourage you to slip into a diminutive red Shinobi shozozu, grab your bow, and get ready to save the day!